TORONTO -- Protesters are expected to gather in front of the Trump Tower in Toronto later today to decry Donald Trump's recent anti-Muslim comments. The Republican presidential candidate has called for a temporary ban on Muslims entering the U.S. in the aftermath of attacks in the country and abroad. His remarks this week have drawn international criticism. The White House said the comments disqualify him from being president and some politicians have joked about banning Trump himself. In Toronto, protesters who say they plan to rally against Trump's statements and celebrate the city's diversity are expected to gather outside the building which bears his name in the city's financial district. The Trump International Hotel and Tower in Toronto is owned by a private real estate development company called Talon International Development, as well as other investors and condo owners. The Trump Organization operates a hotel which makes up part of the building. 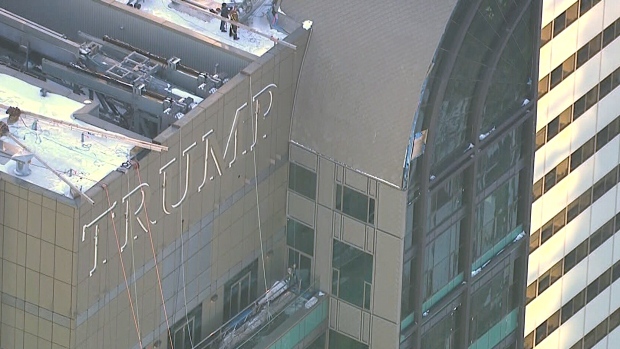 At least one Toronto city councillor has asked the owners of the building to remove Trump's name from the property in light of his recent inflammatory comments. Trump's image and name have been stripped from a Dubai golf course in light of his statements, while Trump Towers Istanbul also says its "assessing" its partnership with Trump. The Trump Hotel and Tower in Toronto says the Trump Organization operates the building but is not the owner. "Donald Trump's opinions as a private citizen in no way reflect the position of the company's views or those of its other investors and owners," the hotel said in statement earlier this week.